The Creek Road Bridge over San Anselmo Creek was constructed in 1929. It supports two narrow 10-foot wide lanes and narrow non-ADA compliant sidewalks on each side, and is supported on an abutment at each end of the bridge and on three sets of two columns in the creek. The Creek Road Bridge crosses a wide section of San Anselmo Creek and connects residents on Creek Road and Forrest Avenue with Bolinas Road, a main thoroughfare into downtown Fairfax. This bridge experienced a significant washout and undermining of its west end support during the floods of New Year’s Eve, 2005, although the water never exceeded seven to eight feet above the creek bed. At that time, the bridge was closed to vehicular traffic due to movements of the end support structure, to allow the Town to implement repairs. While it was closed, motorists used a detour around the bridge via other streets. In 2008, improvements were made by shoring up the bridge end support, and it was reopened for use. A later inspection in September 2010 found no new significant bridge foundation damage. September 21, 2016: Caltrans did not find the Creek Road Bridge eligible for replacement, and approved Seismic Retrofit Strategy Alterntive 2. The bridge is currently in the preliminary design and environmental review stage, and the Town will have another public presentation sometime in 2017 before the design is complete. See below for details. The purpose of the project is to correct structural deficiencies so that the bridge will withstand the maximum credible earthquake for this site. This will start with an assessment of the current state of the bridge, and the development of strategies to seismically retrofit the bridge (including costs). To avoid the higher cost and environmental impacts of working on the elements of the bridge below its deck, the goal of a seismic retrofit project would be to limit the construction work to the superstructure and bridge approach roadway elements as much as possible, and not disturb the creek bed. However, studies may show that the underlying supports of the bridge are inadequate; in that case, some work may have to be done from the underside in the creek bed. After assessing the condition of the bridge, it may be determined that a seismic retrofit by itself would not be adequate to provide a safe bridge, and that a replacement bridge is required. The town of Fairfax and the project team are committed to an open public outreach process; a public workshop will be held in early 2014 to gather input from the community on project features. If it is determined that a bridge replacement is the preferred option, the design will likely emphasize traffic calming and non-motorized elements such as proper sidewalks and bikeways, and the use of special bridge aesthetics to add to the beautification of the neighborhood while reducing vehicle speeds. During all phases of the project, measures will be taken to minimize impacts to residents living near the bridge, and to the ecology of the creek itself. 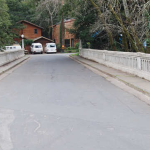 Should the bridge be closed for repairs, it is expected that residents would be able to use Creek Road on the south or Sherman Avenue on the north to access Bolinas Road, as they have during the past bridge closure. Construction activities and duration within the creek must comply with a variety of restrictions and agency requirements. The Regional Water Quality Control Board, the US Army Corps of Engineers, and the Department of Fish and Game all have interests and regulations that impact project alternatives. The project must be sensitive to fish and wild life impacts, noise ordinances, and recreational uses of the Creek. Because it is federally funded, the project must clear both federal and state environmental requirements (NEPA and CEQA). The Creek Road Bridge is on the National Bridge Inventory (NBI), is inspected by Caltrans biennially, and is eligible for Highway Bridge Program (HBP) funding. Thus Creek Road Bridge is eligible for federal funds for seismically retrofitting the structure or for complete replacement. Federal funds would cover 88.53% of the project. The Town has secured new Seismic Safety Program funds to determine the bridge’s vulnerabilities according to today’s Caltrans standards. Funding is supplemented by Toll Credit Program and Proposition 1B funds, which will pay the Town’s 11.47% share. This reduces the Town’s cost to zero for retrofit or replacement of the bridge. Inspections and assessments of the bridge will begin in November of 2013. The determination of retrofitting or replacement is targeted for early 2014, with any construction taking place during 2016. As the project progresses, the schedule will be refined and updated on the project website. The Town of Fairfax and the project team are committed to an open public outreach process for this bridge rehabilitation project. We will be meeting with several groups to gather input, including neighborhood groups, Friends of Corte Madera Creek, and other interested parties. A public workshop on the Creek Road Bridge project was held on January 29, 2014. At the community workshop, the potential replacement of Creek Rd. bridge was discussed. The engineering team’s assessment report indicated it is more cost effective for the Town to replace the bridge than to make seismic retrofit improvements. Due to the low turnout at the workshop, Town staff decided to send a new fact sheet to the neighborhood indicating the possibility of replacement and offer an opportunity to the residents to submit comments and questions via email, before the options are considered by the Town Council. However, since that time, staff has met with Caltrans staff who indicated they will review the report and let us know if they agree with the assessment and, more importantly, if there is funding available for replacement, even if it is deemed a more cost effective solution. Caltrans’ determination will dictate whether replacement is a viable option for consideration. As a result, the project is in a “holding” pattern until Caltrans can complete its review. Periodic updates will be made on this website. Should you have any questions, please submit them via this website. Thank you for your patience.